Madagascar is a potentially prosperous country - rich in rare minerals, precious stones and fishing stocks, with fertile soil and serious, hard-working people. And yet more than 50 years after re-gaining its independence from France it remains one of the poorest countries on earth- where more than 80% of the population of 22 million exist on an income of less than 60 pence per day (92% live off 90 pence a day). Madagascar’s developmental needs in every sector - including education, health, clean water and sanitation are truly over-whelming, as is the level of poverty and very real suffering seen virtually everywhere. £15,000 will build a three classroom primary school in a remote, deprived community- giving a basic education to hundreds of children. And less than £5,000 will install a safe, clean water system - reducing the incidence of cholera and diarrhoea, and even saving the lives of malnourished adults and children who have no choice but to drink polluted water. 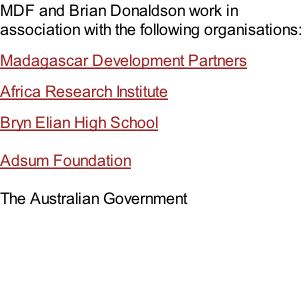 Thank you for visiting the Madagascar Development Fund site. I hope you are inspired by the Fund and what we do, and will make a donation to support our work.